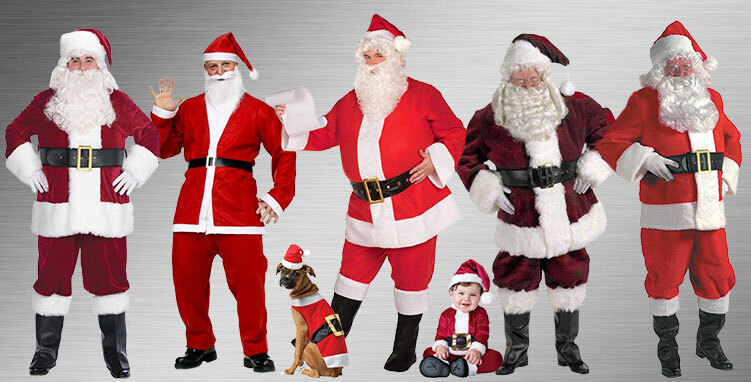 Become the big man of Christmas himself this holiday season or for a Halloween costume party when you shop for Santa Costumes! There are different versions of Mr. Claus' classic red velvet suit, plenty of accessories, beards and wigs, and lots more, all to help you become Father Christmas with ease! Ho, Ho, Ho, Merry Christmas to all! Not only does Santa Claus exist, but he has many personalities that are as real as Rudolph’s nose is red. Whether he’s out at a pub crawl or at home preparing to spread joy to children everywhere, you can bet Santa is always looking great. And who says Santa has to be an old man with a white beard? 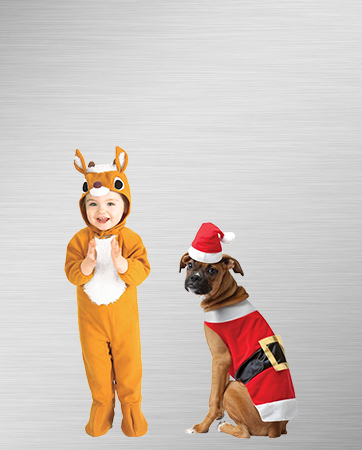 Dress up your pets and babies as this jolly character and the Christmas cheer will never end. The children have been extremely good this year and Santa is gearing up for his journey across the world. Although he’s put in long hours planning, organizing and training reindeer, he’s still the jolliest person you’ll ever meet. He’s everyone’s favorite rosy-cheeked symbol of Christmas! Santa wouldn’t be anywhere without the First Lady of the North Pole. She just popped a fresh batch of sugar cookies into the oven and is always dressed in cheery red from head to toe. She never forgets to put on her white gloves and fur collar when she goes out to feed the reindeer! Sassy Miss Santa runs the show once the snow starts to fall. She keeps the elves in line and decides who’s been naughty or nice. She’ll start the festive fun and keep it going all season long. Whether she’s singing carols or curled up by the fire, Sassy Miss Santa is always dressed to impress. Who said that bearded old men get to have all the fun? This elegant Mrs. Claus takes the classic red and white ensemble to a whole new level. Graceful and full of style, everyone’s heads will turn the moment she enters a room. Nothing is cuter than a mini Saint Nick! 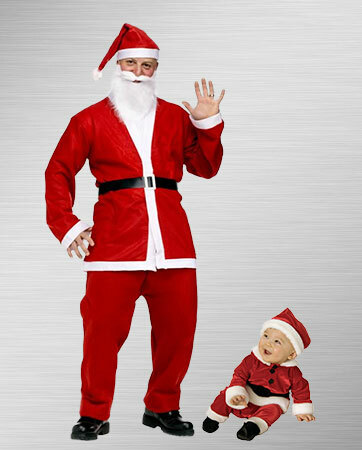 Your baby will have a holly, jolly time as you tote him around in his furry getup. He may not be able to ride in a sleigh, but he’ll have an everlasting good time, anyway! This little Santa-in-training is learning the trade of delivering toys and gifts to children around the world. He’ll get everyone in the winter spirit as he sings and dances to all his favorite Christmas tunes. Lighten up the mood with the Girl's Santa's Helper Costume. Dress up like a hard-working elf that is ready to finish all the presents before Christmas Day! Even Saint Nick needs a helper every now and then. This Santa Paws keeps the reindeer in line when Santa’s not around. One look at this holiday pup and you’ll find endless Christmas cheer. Christmas isn’t just about Santa. There are so many other people involved! Gather your friends and family for a holiday dress-up extravaganza. Maybe it’s Halloween and you’re already in the winter spirit. Maybe it’s Christmas and you’re ready to spread some holiday cheer. Whatever the occasion, there’s a costume for everyone to feel like they’re part of the group. 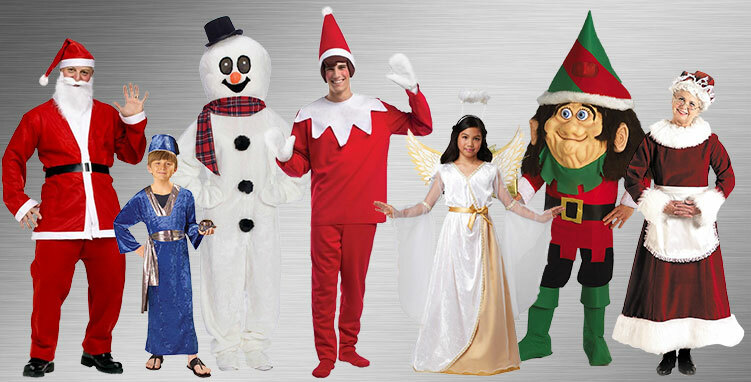 From snowmen to angels and wise men to elves, the Christmas character options are never-ending. And, of course, you can’t forget about Mr. and Mrs. Claus. Santa Junior can learn a lot from Santa Senior, from flying sleighs to keeping track of eight reindeer. Saint Nick has a tough job and he’ll need a helper one day. Don’t these two make an adorable pair? Where would Santa be without his loving team of elves? The elves work hard year-round to ensure Santa will be ready to go on Christmas Eve. 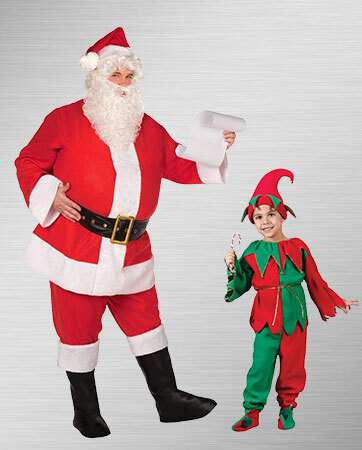 If you’re dressed as Santa, you'd better have an elf by your side. Santa pup and his baby reindeer are two peas in a pod. Dress them up for the cutest Christmas pictures around, or have them answer the door to delight every trick-or-treater on the block. Whatever holiday you're celebrating, this pair brings the fun. A classic duo, Mr. and Mrs. Claus are the epitome of Christmas Cheer. This classic couple's costume will get lots of laughs throughout the night. You two will have everyone wishing they thought of your idea! 1. The velvet hood keeps Santa warm when he’s flying above the clouds in his sleigh on Christmas Eve. He wouldn’t leave home without it. 2. The satin lining on this costume means Santa doesn’t mess around. He prefers the finest-quality fabrics for his winter ensemble. 3. The faux rabbit fur trim gives this costume that iconic Santa appearance. No one will be struggling to guess who you are. 4. 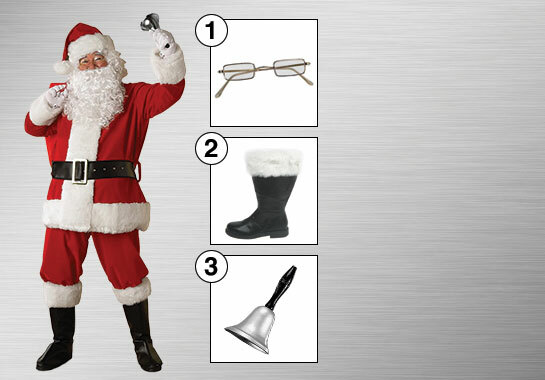 The embroidered accents on Santa’s belt give this costume a one-of-a-kind feel. 5. 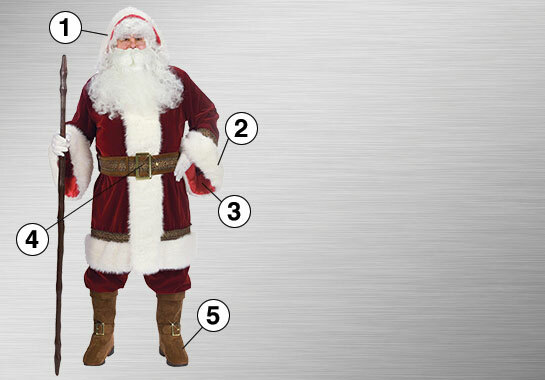 Faux-brown boot tops give Santa’s outfit a complete look from head to toe. 1. Santa Glasses: How will Santa fly his sleigh without his trusty glasses? He needs these to see and navigate the skies as he flies throughout the night. 2. Trek through the snow with warm feet in these black Santa boots. Complete with fur trim, these boots are what’s missing from the perfect Santa costume. 3. Ring the bell and spread holiday cheer. This bell works great at pageants and parades, helping you grab everyone’s attention.